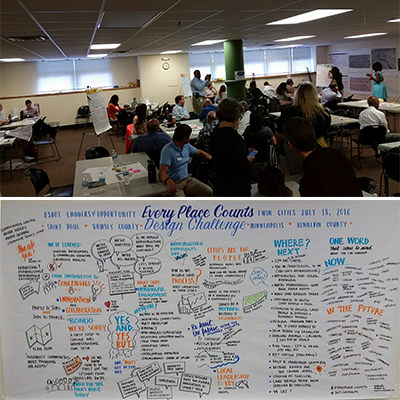 Scott Neal, AIA, LEED AP, Director of Design at Wendel, participated in the Every Place Counts Design Challenge workshop in St. Paul, MN on July 18-19. This federally-funded initiative seeks to raise awareness and identify innovative community design solutions that bridge the infrastructure divide and reconnect people to opportunities. The Congress for the New Urbanism (CNU) is assisting the U.S. Department of Transportation (USDOT) with the design challenge. The St. Paul-Minneapolis workshop focused on the following (according to USDOT website): The construction of I-94 divided the Rondo, a historically African American community in the Minneapolis metro area, and as the city has grown more diverse, ethnic enclaves are still clustered on either side of the highway, now including Asian Americans and Native Americans as well. The community would like to develop exemplary models of community design and engagement to guide future corridor planning efforts. The community team worked through two separate issues affiliated with the I-94 corridor being constructed in the 1960s. The first being the new bridge on Dale Street that has the opportunity to help augment the Rondo community, which was decimated by the construction that went right through the center of the community. The second project involved Prospect Park, where the team worked on getting connections to the Midtown Greenway bike system. Learn more about the Every Place Counts Design Challenge here.